Continuing on from my post last week about the barriers to making the health benefits of work a reality, I wanted to explore what happens for our clients whenit is a reality. One of the unfortunate side effects of providing rehabilitation for our clients is that normally we’re asked to cease our involvement after a person returns to work. This means that we rarely get to see the positive effect that being back at work can have on a person’s life. However myself and my team are lucky enough to be able to provide ongoing support to people who we have helped get back to work. This is a trend that I would like to see grow in the future – returning to work is just tiny bit of the recovery puzzle for our clients. Actually, the fun only really begins after someone returns to work. But that’s a post for a different day. Purple Co had the opportunity work ongoing with a gentleman with a spinal cord injury, who went from being a fit man with a family to using a wheelchair and no longer able to perform his old job. To say that this had an impact on every area of his life is an understatement; it shook his world and in the years following his injury, this gentleman was on the brink of a marriage breakup and had almost surrendered to being on welfare for the rest of his life. He wanted more but felt hopeless. 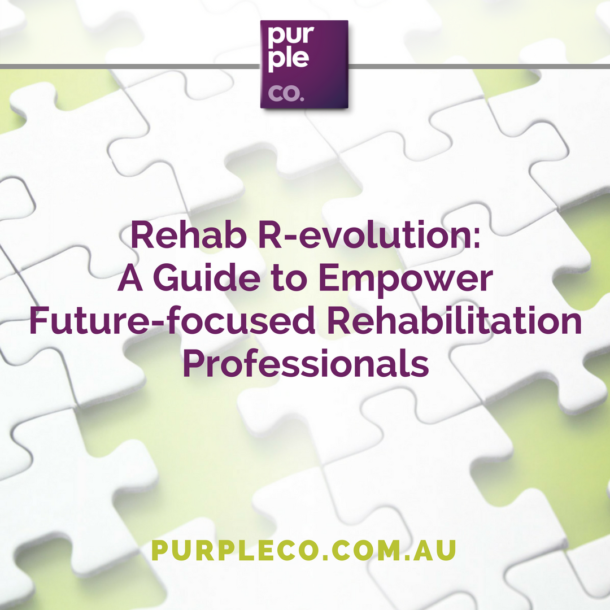 In the following months, we had the chance to do some incredible rehab with this client. We could have put him back to work in a role at a call centre quite easily – and he would have hated us for it. We would not have seen the health benefits of work in action in this scenario. So we took a slower road. To shorten the story, this man is now back at work with his old employer in a new role that uses new skills that we were able to support him in undertaking training for. His reliance on attendant care has significantly decreased. So it begs the question – when we approach return to work, are we asking our clients (and ourselves) whether our plans and strategy will actually help someone achieve all the things that good work can offer? Or do we just want the outcome? If its the latter, it might be time to re-evaluate. I’d love to hear how you’re making the health benefits of work happen. How do you approach these conversations? How can we reach a shared understanding to make sure everyone involved is on board?